In winter, I am often dressed in dark colors. In order to brighten up the black coat that is my winter uniform, I could take inspiration from actress Elizabeth Olsen at the Sundance Film Festival and wear more colorful accessories. 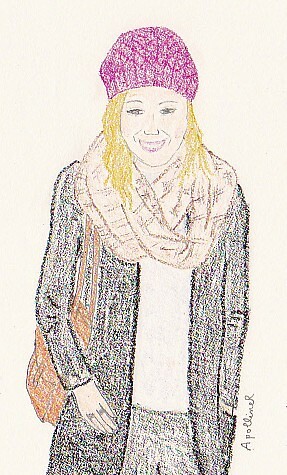 In my drawing, she’s wearing a purple beanie, a patterned scarf and a camel handbag. I guess the key is to accessorize in the winter because like you said, we tend to wear darker colors. I have a purple/pink handbag that I love, and hat/scarf often come in colorful tones.